An island in the Krabi Province in Thailand, Koh Lanta is an idyllic spot of nature which is home to tropical rainforests and limestone rock formations. 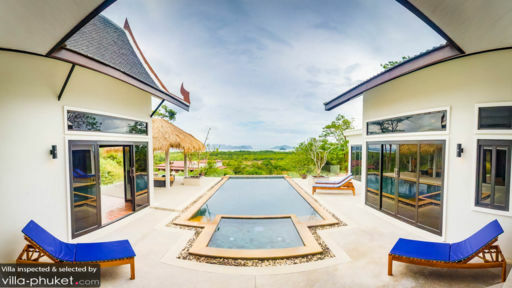 Villa Shamballa is a new property on the coast of Koh Lanta, overlooking the Andaman Sea and the lush tropical foliage growing all around the property. 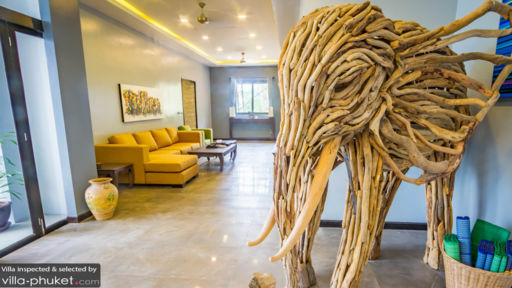 The three-bedroom holiday resort is a newly-constructed property offering quality services and a chance to discover the beauty of the neighboring beaches and sites that are in abundance around the area. The villa boasts of three, air-conditioned bedroom suites that are furnished with teakwood furniture. The master suite is furnished with a king-sized bed and its doors lead to a private terrace which is an idyllic place for some recuperation as the beautiful sea greets your eye. The second bedroom is also furnished with a king-sized bed and the third bedroom is furnished with single beds which can be joined to form another king-sized bed. The rooms have direct access to the swimming pool, ensuring that you can move around with ease. The en-suite bathrooms are fitted with wooden paneled-shower areas. The outdoor area of Villa Shamballa is marked by the endless seas in the distance, which can be enjoyed from the comforts of the 10-metre swimming pool, with an Indonesian ‘lava tile’ surface. There is a children’s splash pool at one end and a bench at the deep-end, which is also known as the ‘sunrise’ end, as you can enjoy the stunning sunrise from this vantage point. There is a thatched-roof sala on the pool deck, which is a great location for indulging in yoga sessions and in-house massages. There are sun chairs for lounging and sunbathing also kept poolside. The family room is the main living pavilion of the villa which is fully-furnished to cater to your entertainment and leisurely needs. The glass doors allow abundant natural light to seep into the room, and the sea breeze to flood the room with a well-aired ambiance. It is furnished with comfortably placed couches and a wall-mounted flat-screen TV where you can enjoy watching films with your loved ones. The room is brightly decorated with vibrant artwork and is contemporary with its décor. The minimal and simple aesthetics of the living area give it a luxe vibe. Beside the pool, you will find the dining pavilion and kitchen which is a beautifully lit room given the foldable glass doors and a number of windows. The wooden trusses in the ceiling give it height making it more spacious and airy. The 8-seater wooden table is perfect for digging into your meals. The kitchen is fully-equipped and modern offering all the necessary appliance and amenities. With open spaces that allow you to move without obstruction, Shamballa is a personal oasis where you can do as you please while the natural ambiance eases your soul. The villa offers weekly cleaning and other amenities to its guests, along with a complimentary taxi service from the airport for those staying for longer than five days. The staff can arrange a massage for the guests, on request. 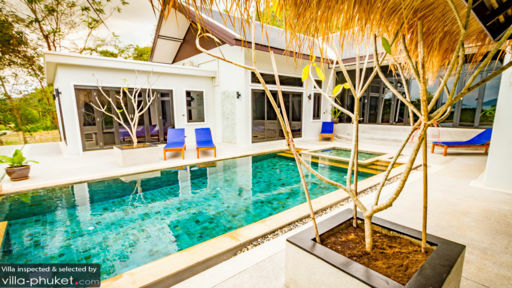 The villa itself is located in a quiet and serene part of Koh Lanta, however, many of the great restaurants of the island are in the vicinity. The charming Lanta Old Town which is an old-timer village offering you a glimpse into the culture and traditional practices of Thailand. If it’s the beach you crave then Klong Nin, the most popular beach in Koh Lanta is only 5 minutes away from the villa!